Kick off your shoes and relax! 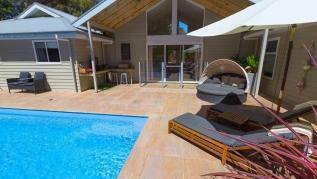 Barefoot Escape is a luxury adult retreat situated on a one hectare property yet it is conveniently just minutes from Margaret River town centre. Barefoot Escape with it’s deliciously warm heated floors consists of a spacious living area with vaulted cathedral ceiling complete with all the comforts of home including reverse cycle air conditioner, a kitchenette and a huge separate bedroom with king-size bed complete with Logan and Mason luxury linens. The opulent bathroom offers a huge double-ended bath tub or step into the double rain shower, completed with deluxe bath products, plush bath sheets and soft towelling robes.French doors lead into a privately enclosed outdoor area with swimming pool, BBQ, and loungers perfect for lazing around the pool. Pool and beach towels provided. Here you can relax, read a book or take in the array of Tall Timbers and listen to native birdsong. So many complimentary indulgences. 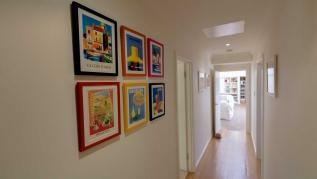 A bottle of wine as well as coffee pods (nespresso machine) and a selection of teas at your disposal. Bottles of mineral water, fresh milk, local chocolate, bath bubbles and the list goes on. 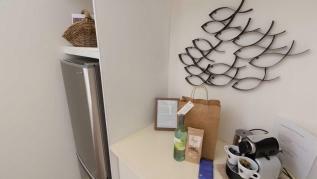 The careful consideration for the ‘little details’ will no doubt make your stay comfortable and memorable.Location:Barefoot Escape is situated off Wallcliffe Road approximately 2 kilometres from the township of Margaret River. Conveniently located, a walk into town takes around 30 minutes, the beach is less than a 10 minute drive, and beautiful walking trails and river is mere minutes away. 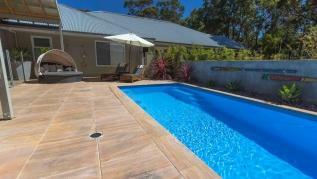 Recently had the opportunity to stay at Barefoot Studios, Margaret River and must say it was thoroughly enjoyable. Very comfortable and quiet and close to lots of attractions it was a perfect choice. Our 3 days was definitely not long enough to see all that the region has to offer so this will certainly be our choice of where to stay on our next visit. 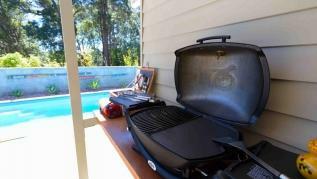 The accommodation is well presented and clean with bbq and pool. Very hard to fault and certainly recommended. Excellent spacious property with everything you could possibly think of! ★ ★ ★ ★ ★ Extremely comfortable mattress. Spotless apartment. Perfect location. So peaceful. Lots of wildlife. What a fabulous place. When we left Darwin it was 35 degrees and 93% humidity so these temps are heavenly. I have enjoyed relaxing in this tranquil environment & sleeping soundly at night. It is a gorgeous home away from home and we will definitely be back. We travel a lot and this is definitely one of our favourite destinations. Thank you for the comfortable bed - it is so hard to find good beds and pillows when you are away from home. Congrats! Thanks so much for an amazing stay at Barefoot. It is so well appointed, and really feels luxury. The all important bathroom is huge and beautiful and feels better than a 5 star hotel. Fantastic shower too. The living room and bedroom also gorgeous and felt like we had so much space to enjoy. The location of Barefoot is perfect too. It's a great place to be based for the wineries (we really enjoyed visiting Hayshed, Pierro and of course Leeuwin Estate). And just a few minutes drive you're right in town (Pizzica was excellent) or the other way on the cape to cape track. Thanks for the little extras too, really nice touches to make our stay that little bit special. Good advice in the book, we were in need of some advice from a pharmacist and the 777 in town were really brilliant. One of the best holiday places we've stayed in for sure, v highly recommended. Beautiful setting close to town and beaches but perfectly secluded. 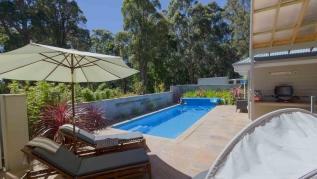 Private pool and very comfortable accommodation. Friendly and helpful owners close by. Our second visit in 5 years and would definitely visit again. We recently enjoyed a four night break at this amazing property. From the moment we arrived we felt relaxed and at home. This experience was added to by the lovely little touches the house has throughout from the huge bath to the private pool, the lovely bed to the range of DVD's on hand to watch in the evenings with a bottle of local wine! We even woke up to a basket of home grown peaches and nectarines and were even asked what wine we preferred to have as a courtesy bottle on our arrival. We truly hope to return soon as this could easily become our haven away from the insanity of our daily work lifes. Thoroughly enjoyed our stay at the property . Lots of tiny details made the stay extra special and enjoyable . The welcome pack was lovely , the robes and slippers were great and luxurious . The bed and linen provided was extremely high quality and provided an amazing nights sleep . 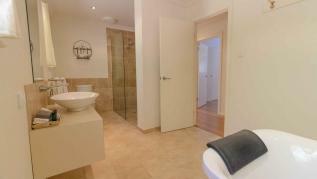 The bathroom was huge with an amazing bath for a relaxing soak . The shower was also luxurious and massive . The blankets and picnic basket was great for when we went to the outdoor movies . The patio and pool area was amazing . I loved the round day bed . It was my favourite place to relax . The BBQ was immaculate and had all that was required . All in all the property was a very high standard and my husband and I were very impressed and will definitely want to stay again . This property brings you best of both worlds, it's less than 5 minutes to the Margaret River CBD yet very secluded, tranquil, surrounded by nature all around. Size of the property gives you the sense of freedom and comfort. Amazing property and we'll be coming back for sure.